is honored on Panel 25W, Line 9 of the Vietnam Veterans Memorial. 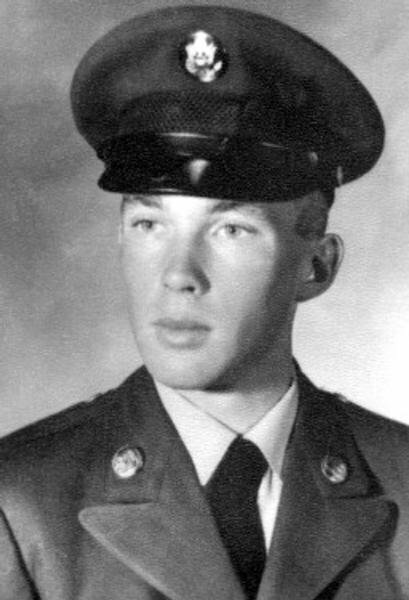 Specialist Four James Allen Blain, Served with Company C, 5th Battalion, 7th Cavalry Regiment, 1st Cavalry Division. THANK YOU FOR YOUR SERVICE AS N INDIRECT FIRE INFANTRYMAN WITH THE 1ST CAVALRY. A FRIEND'S BROTHER WAS 1ST CAV, SAY HI TO HIM, HIS NAME IS MIKE. IT HAS BEEN FAR TOO LONG FOR ALL OF YOU TO HAVE BEEN GONE. WE APPRECIATE ALL YOU HAVE DONE, AND YOUR SACRIFICE. WATCH OVER THE U.S.A., IT STILL NEEDS YOUR COURAGE.. GOD BLESS YOU. MAY THE ANGELS BE AT YOUR SIDE. REST IN PEACE. MANY OF US HAVE BEGUN OUR JOURNEY TO EASTER. AND YOU ARE ALL IN OUR PRAYERS. My Cousin, My Friend. We were so close in miles when we were so far from home. If only we could have met there - just one more time.